The Required Posters is a general labor law poster poster by the Idaho Department Of Labor. This is a mandatory posting for all employers in Idaho, and businesses who fail to comply may be subject to fines or sanctions. This set of posters must be posted in a conspicuous place where all employees will see them. These posters describe all of the laws that must be followed in the workplace. ID All-In-One Labor Poster: Instead of printing out dozens of posters, employers can also purchase an all-in-one poster that covers both Idaho and Federal poster requirements by clicking here . It appears you don't have a PDF plugin for this browser. 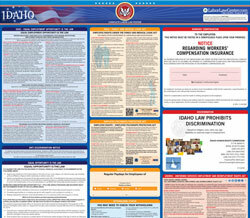 Please see the link below to download idaho-requiredposters.pdf. pra ctices w here the ac commod ation does not  impose undue  hardship. individual  with a disability who is an  applicant or empl oyee, barring undue hard ship. referral, and other aspects of employment. e mployees, or th eir family members. pro ceeding, or  otherwise opposes an  unlawful employment p ractice. in most telephone directories in the U.S. Government or Federal Government  section. Additional information about EEOC, including information about charge  ﬁling, is available at ww w.eeoc.gov. ensure equality of oppor tunity in all aspects of employment. which an Ar med Fo rce s ser vice m edal was awarded). The Ofﬁce of Federal Contract Compliance P rograms (OFCCP), U.S.
Depar tment of Labor, 200 Constitution Avenue, N.W., Washington, D.C.
accommodation, can per form the essential functions of the job. contact the Federal agency providing such assistance. OVERTIME PAY	At least 1½ times the regular rate of pay for all hours worked over 40 in a workweek. employer must make up the difference. 90 consecutive calendar days of employment with an employer. Minimum Wage and the Wage Payment Act. 800-377-3529 for  Idaho Relay Service. EMPLOYEES (SECTION 44-1507, IDAHO CODE). SECTION 44-1505 AND 44-1506, IDAHO CODE. Idaho Department of Labor is an equal opportunity employer. Dial 711 for Idaho Relay Service. basis of the individual’s citizenship status or participation in any WIOA Title I-financially assisted program or activity.  Making employment decisions in the administration of, or in connection with, such program or activity. 4123, Washington, DC 20210 or electronically as directed on the CRC Web site at www.dol.gov/crc. your complaint with the recipient). date on which you received the Notice of Final Action. speak	 in private to the inspector. of	 an	 eye within 24	 hours. place	 of the alleged violations. certain private individuals engaged in national security-related activities. of pharmaceutical manufacturers, distributors and dispensers. to have test results disclosed to unauthorized persons. also bring their own court actions. screening or during the course of employment. WHERE EMPLOYEES AND JOB APPLICANTS CAN READILY SEE IT. •	 within 75 miles of the employee’s worksite. Security Law of the State of Idaho. from taxation against the company or employer. IS DEDUCTIBLE FROM YOUR EARNINGS. Don’t delay or you could lose your benefits. Claims should be filed immediately after separation. bined total of 26 weeks of all types of FMLA leave. discharge or under other than honorable conditions. military service or, in some cases, a comparable job. person has no service connection. for service connected illnesses or injuries. be viewed at  http://www.dol.gov/elaws/userra.htm . against an employer for violations of USERRA. and employers may meet this r equirement by displaying the text of this notice where they customarily place notices for employees. rvices, and applicants to the uniformed services. There are an additional one optional and mandatory Idaho labor law posters that may be relevant to your business. Be sure to also print all relevant state labor law posters, as well as all mandatory federal labor law posters. Instead of printing out pages of mandatory Idaho and Federal labor law posters, you can purchase a professional, laminated all-in-one labor law poster that guarantees compliance with all Idaho and federal posting requirements. Fully updated for 2019! While we do our best to keep our list of Idaho labor law posters up to date and complete, we cannot be held liable for errors or omissions. Is the poster on this page out-of-date or not working? Please let us know and we will fix it ASAP. LaborPosters.org will email you a printable PDF of this Idaho labor law poster, 100% FREE. You'll also get notified when new posters are available. This poster download is provided as-is, with no warranty or guarantees. Please verify with Federal and Idaho authorities to confirm that you are posting all of the correct (and updated) posters required for your type of business. Instead of printing out pages of mandatory Idaho and Federal labor law posters, you can purchase a professional, laminated all-in-one labor poster.